A survivor-centered approach to working with victims of crime and the implementation of an extensive security camera system have landed the Virginia Commonwealth University Police Department on the world’s radar. VCU Police was recently honored with two international awards during an International Association of Chiefs of Police conference in Chicago. For excellence in victim witness services, the department was one of six law enforcement agencies worldwide — and the only agency in higher education — to win an honorable mention. VCU Police Officers Andrew Hudgins and Michael Brandon sign Start By Believing pledges in April 2014. VCU Police joined the national Start by Believing awareness campaign to encourage friends and family members of sexual assault victims to believe them, and be supportive of them, when they disclose an assault. VCUPD won in the category for small agencies, which is based on the number of sworn officers. 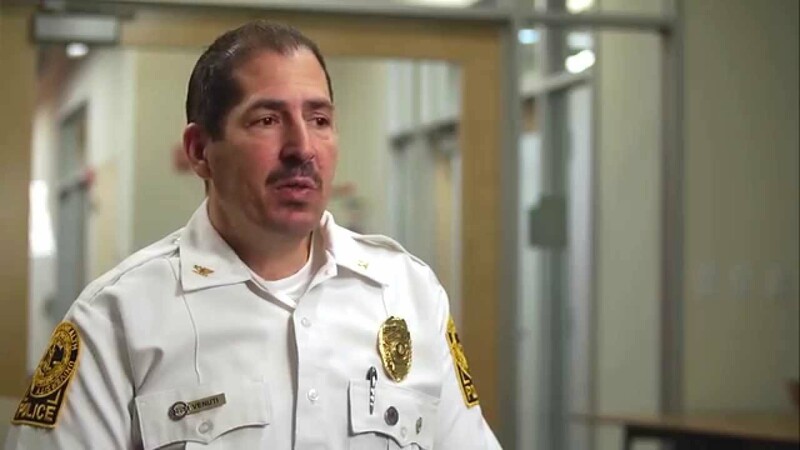 “With a dedicated victim-witness officer, a dozen patrol officers who are victim-witness specialists and really strong connections across the university, we’ve been able to offer individuals solid support and direct them to the resources they need following an incident,” said VCU Police Chief John Venuti. Officers can assist victims with attending court dates, seeking restitution for damages from a crime, receiving on- or off-campus counseling and health services and advising them on issues of confidentiality and personal protection. VCU Police was also honored with the Michael Shanahan Award for Excellence in Public/Private Cooperation. According to IACP, the award is given in honor of University of Washington Police Department Chief Michael Shanahan (retired), who served that agency for 24 years. The award recognizes outstanding achievements in the development and implementation of public-private cooperation in the public safety field. VCU Police received an honorable mention for a private/public project with SyCom Technologies. In recent years, VCU Police worked with SyCom Technologies to create and install an extensive security camera system with cameras on both of VCU’s Richmond campuses. The company offered initial proof of concept work to the department pro bono to identify the areas that required surveillance, among other goals. A still image from one of the more than 600 security cameras at VCU. An existing camera system at VCU had outdated technology and produced grainy images for investigators; those images were ineffective at providing useful information about crimes against students, faculty and staff. In August 2013, VCU Police launched an upgraded camera system. Today, that system has more than 600 cameras. There’s a strong possibility that anyone coming to the VCU area with intentions other than living, learning or working, is going to be captured on a camera. To date, valuable video and photographic evidence has contributed to more than 840 cases, including car accidents, robberies, assaults and thefts. In some cases, the system has helped investigators determine that a reported crime did not actually take place. Since VCU campus footprints are part of the city of Richmond, footage has also been used to assist the Richmond Police Department. “There’s a strong possibility that anyone coming to the VCU area with intentions other than living, learning or working, is going to be captured on a camera,” Venuti said. This isn’t the first year the department has won accolades from law enforcement’s premier professional organization. In 2014, IACP selected VCUPD as first in the nation among colleges and universities for its National Law Enforcement Challenge. The award recognized traffic safety programs for 2013 with a focus on those that address issues including impaired driving, occupant protection and speeding. IACP is the premier law enforcement association in the world with 16,000 members in 94 countries. VCU Partnered with SyCom and Cisco for a Massive Upgrade to Its Physical Security/Video Solution.